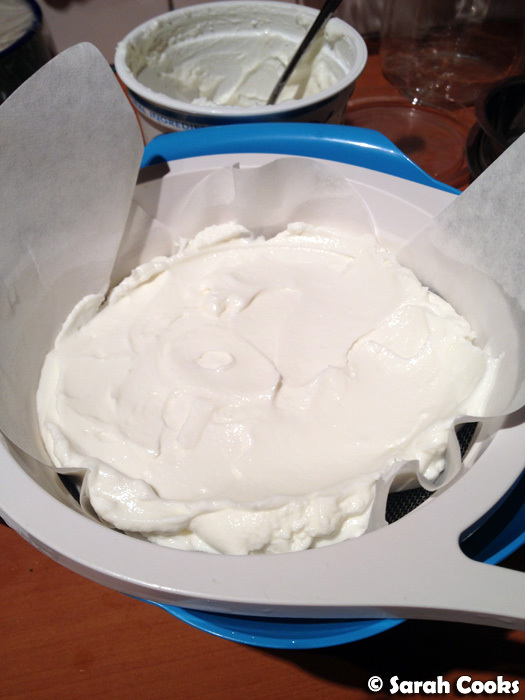 "How to make labneh", or "Fun things to do with strained yogurt". 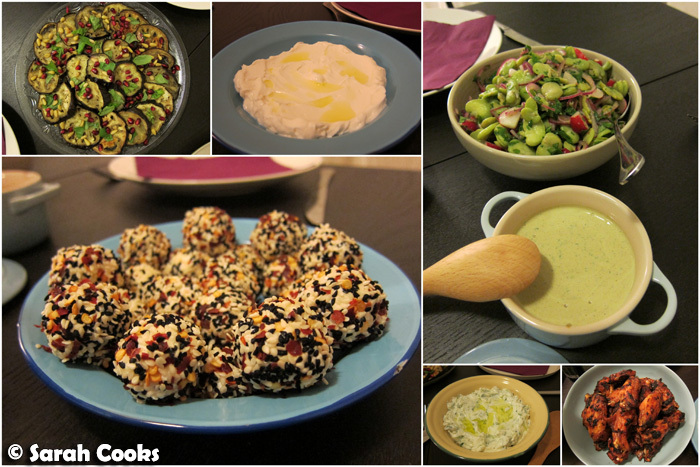 So, as you saw in my previous post, I had some fun playing around with the massive sample of yogurt that Chobani sent me, culminating in a yogurt-themed dinner party where I made as many yogurt-based dishes as I could to finally, finally finish all the yogurt! (Yes really, and my friends are used to the funny names I give our dinner parties, e.g. PORKDATE, PORKTOBERFEST). One thing I was quite keen to try was making my own labneh, or strained yogurt, which I'd read that you can serve as a dip, in balls (heh) as a mezze item, or even as a substitute for cream cheese. 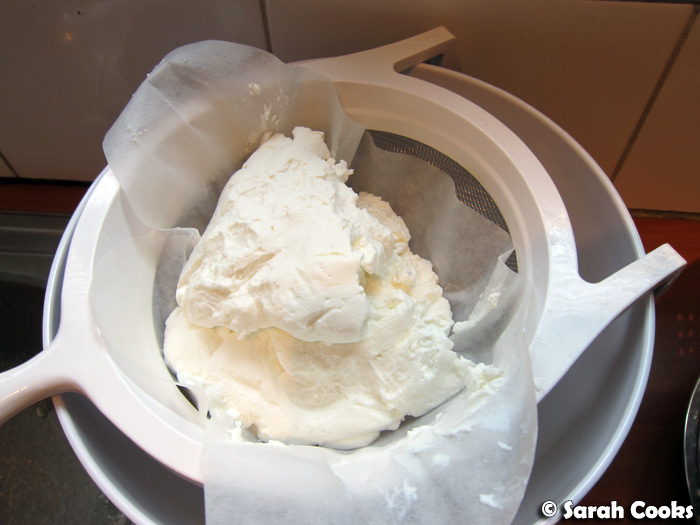 A quick web search reveals dozens and dozens of guides on how to make strained yogurt - so rather then providing a step-by-step guide, I'll just show you the steps I took to make mine, and the fun things I then made with it! Although I used Chobani 0% Greek yogurt, any Greek-style unsweetened yogurt will do. 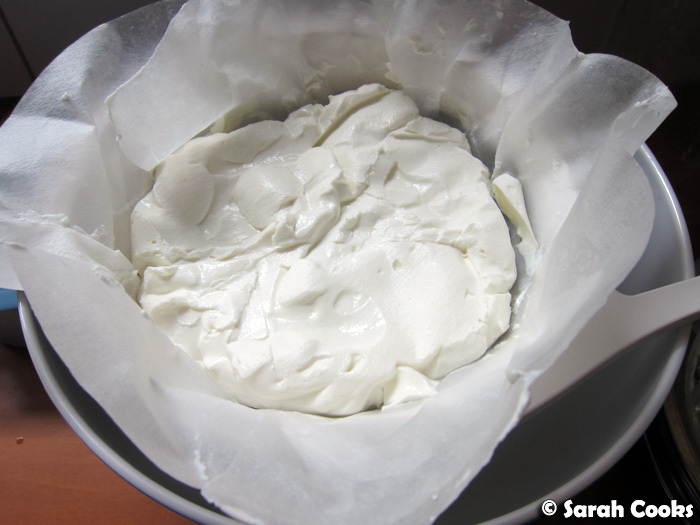 The point of straining yogurt is to remove excess moisture from it, and to make it a bit thicker and creamier. Traditionally muslin cloth is used, but paper coffee filters work well too. 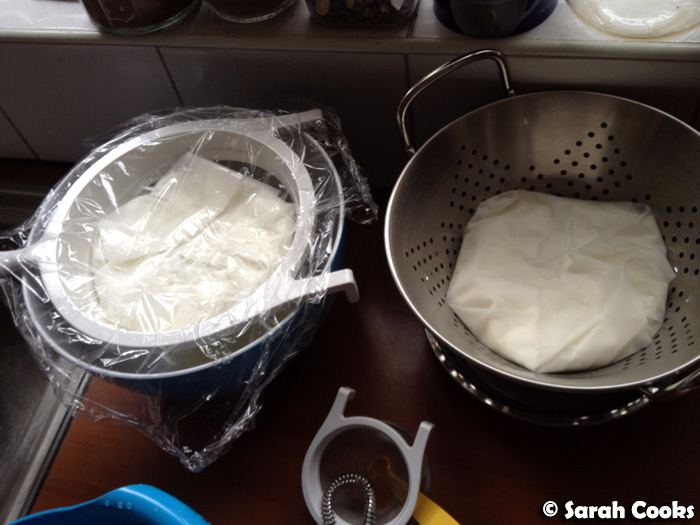 (I do have muslin lying around somewhere, but couldn't find it when it came time to strain the yogurt, hehe). So, the day before I wanted to eat the strained yogurt, I placed a sieve over a bowl and lined it with a coffee filter. I then mixed the yogurt with a good few pinches of salt and spooned it into the lined sieve. I loosely covered the sieve with glad wrap, and let it sit overnight to drain the liquid. (In hot weather I'd put it in the fridge, but it's been cold enough lately for it to sit on the bench). The length of time you leave it depends on how thick you want the finished product to be. 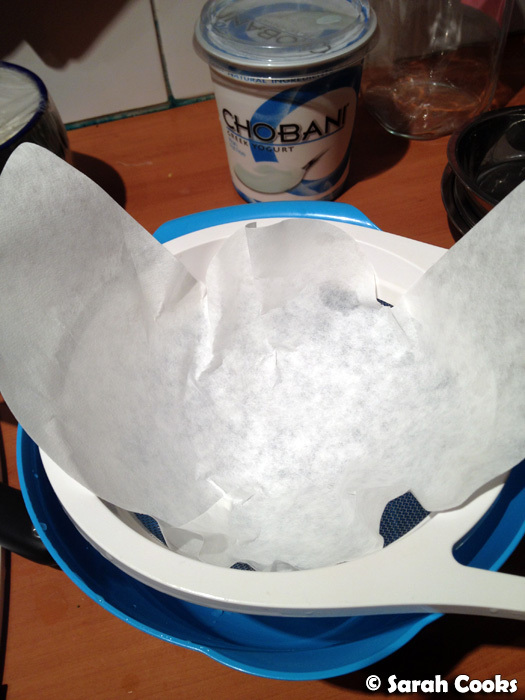 Chobani yogurt is already strained, so I found that it took a bit less time than the guides I'd read online. As all yogurts vary, use your eyes as a guide, or just give the yogurt a poke through the glad wrap to see if it's at your desired texture. The batch you see above took about 18 hours until it was firm enough to roll into balls. I also wanted some strained yogurt that would be creamy, but not quite solid, for dips and icing, so I also put another batch on the next morning, which drained for about 3 hours in total. (I changed the papers a couple of times during the draining process, once they'd gotten completely soaked with liquid. But the papers I had were pretty hardy and didn't rip or tear at all, so I don't think it's entirely necessary to do so). Quite a bit of liquid came off during the straining process - apparently it's quite healthy for you, but I really had no idea what to do with it, so I just poured it out. Here's the 18 hour batch after straining... it felt quite firm and bouncy to the touch. I rolled the yogurt into little balls, (bit of a messy process but I got there in the end), and then in a mixture of sesame seeds, nigella seeds and dried chilli flakes. You can use any mix of spices (or none at all! ), but I was quite taken with the red-white-black colour combo! So, with the 3-hour strained yogurt, I made a bowl of tzatziki (David Lebovitz' recipe), a bowl of labneh dip (i.e. 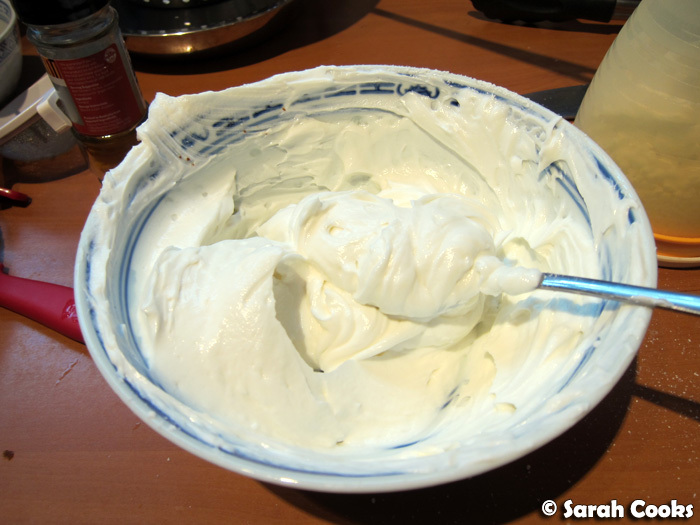 I just put the creamy strained yogurt in a bowl and drizzled it with extra virgin olive oil), and some icing! I've read in lots of places that you can use strained yogurt as an alternative to cream cheese, but couldn't find any actual recipes for it, so I just winged it! To make the strained yogurt icing, I squeezed in some lemon juice (lemon zest would be a good idea too), and beat in sieved icing sugar until it was sweet enough and got to a spreadable-but-not-runny consistency. Ta-dah! And now - yay! - here's the actual meal we had for the yogurt party! You'll see (obviously) a strong Middle Eastern influence, with a centre-of-the-table mezze approach. Clockwise from top left we have: Ottolenghi's eggplant with pine nuts, pomegranate and saffron yogurt (unstrained yogurt); labneh dip; Ottolenghi's radish and broad bean salad with green tahini (no yogurt in this one); Nigella's garlic chicken wings from How to Eat; David Lebovitz' tzatziki; and my labneh balls! We also had some Turkish bread, dukkah (supermarket) and olive oil as accompaniments. The olive oil in question was the deliciously peppery Sleeping Giant olive oil, which was given to me on our trip to Euroa, and produced from The Weekend Local's own olive grove. We had a few labneh balls left over, and as we were heading out on a trip to the Mornington Peninsula the next day, I didn't want to keep any leftovers. So, I put the balls in a sterilised glass jar, covered them in olive oil and gifted them to my friend Alaina! Ah, and now I bet you're wondering what I did with the strained-yogurt icing! Well, I figured you could use it on any cake that you'd ordinarily use a cream cheese icing for - you know, carrot cake, red velvet, that sort of thing. When menu planning, I knew that I'd have pomegranate seeds left over, and wondered if I could somehow combine cake with icing with pomegranates. 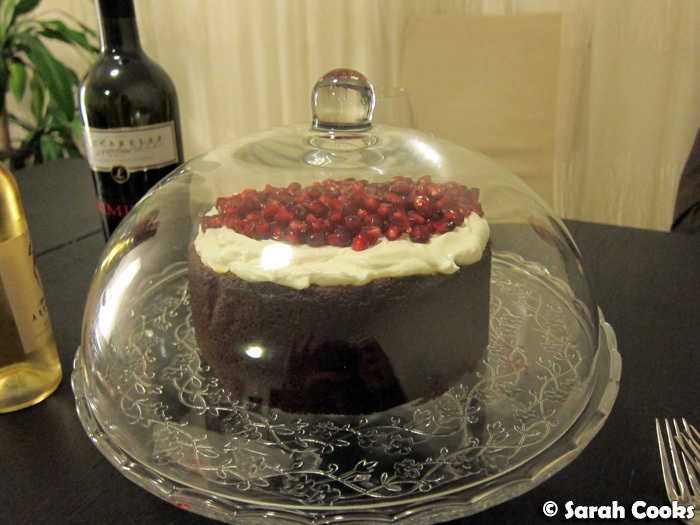 Seeing a pomegranate-topped cake in last month's issue of Donna Hay magazine, and a vanilla pomegranate cake on Shellie's blog recently reminded me of Nigella's pomegranate jewel cake, in the Rosh Hashanah chapter of Feast. However, when I looked at the recipe, I saw it was a flourless almond cake, which didn't really appeal to me at all. On the opposite page, though, was a recipe for honey cake, a cake rather like a sticky damp gingerbread, heady with mixed spice, and served either plain or with butterscotch sauce. I thought it sounded perfect for my purposes! 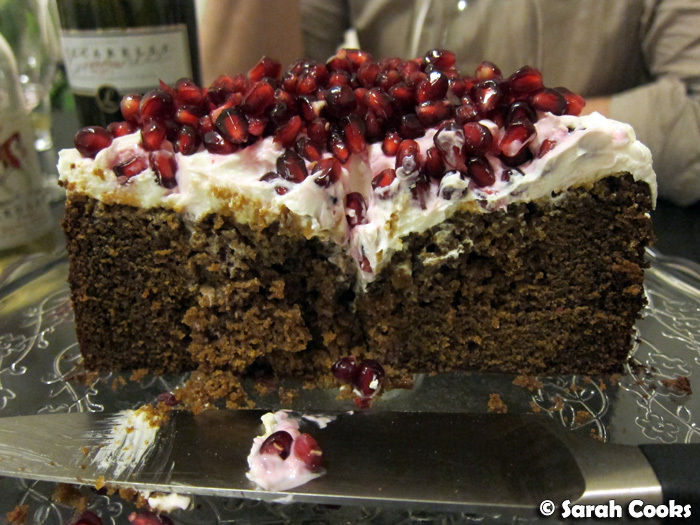 So, I made the honey cake, topped it thickly with the strained-yogurt icing, and scattered the pomegranate seeds over. It was very easy, but I felt it looked quite impressive. I do love having a cake dome sitting on the table when people arrive! The honey cake looks delicious too, I couldn't think of a better way to use up yogurt than to make cake! 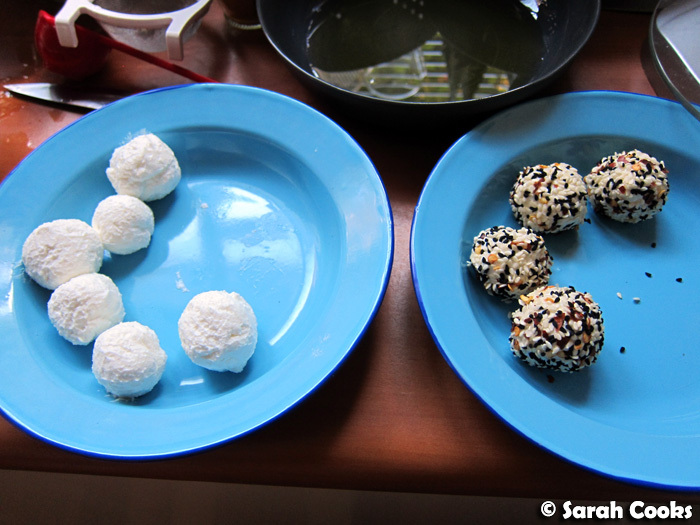 I am still dreaming of the labneh balls, and I just finished the last of the olive oil today! I brought some crusty bread to work and soaked up the last of the oil and seeds. 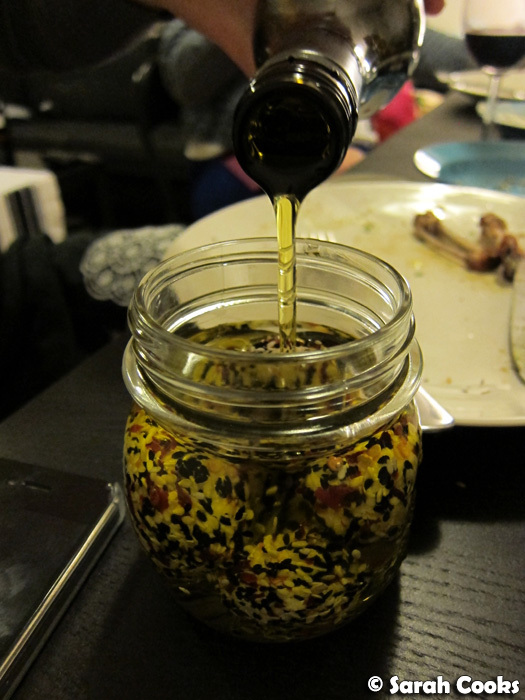 It was the best olive oil I have had in a very, very long time. you're darn amazing when it comes to feasts like these! Alaina - Thank-you! I really liked that olive oil too - next time you're in Euroa you should pick up a bottle! (And bring one home for me, hehe). GREAT idea! I am so going to do this too! Great idea! I am so going to do this. You did a great job! I love the idea. Perfect for trying something new for a small party!